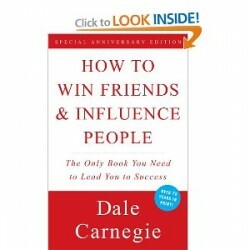 How to Win Friends and Influence People Review-I received the book as a contest prize (video review below), and it’s been one of the most valuable prizes I’ve ever won. All of us have strained relationships, ideas we want to move forward, and connections we want to make. I’ve picked up a piece of advice on each of those topics that has helped me in my professional and personal lives. These ideas are, for the most part, common sense. We already know some of them. But I think the difference for me is knowing that some of the most successful people in the world have used these ideas to achieve what they have. If you are looking for ideas on how to win friends and influence people, get the book today! This book is the original “how to” book for leadership, influence, communication, etc. There are so many great ideas that it’s hard to settle on just one! This entry was posted in General, Video and tagged Book Review, How to Win Friends and Influence People, Video on May 25, 2010 by Ben.